Continuity mistake: When Robbie and Julia are making their friend the limo driver run through the obstacle course to prove his driving ability, you can clearly see both right-side hubcaps come off the car. Then, just a few seconds later, the hubcaps are back on the limo. Continuity mistake: During the 50th wedding anniversary party, after Rosie is done singing, she walks over to her husband Frank and they embrace with her on the left, and him on the right. The camera cuts away to Adam Sandler, then back to them, only now Frank is on the left and Rosie is on the right. The camera cuts to Adam again, then back to the couple where they are in their original positions. Continuity mistake: In the scene where Sammy swerves his limo around the cones, when he stops to pick up the dummies, the limo is not in-line with the cones, in the next shot, it's perfectly in-line, then it changes back again. Continuity mistake: When Robbie (Adam Sandler) is lying in the trash dumpster, after he just got dumped, you can see him covered with trash. Then the camera switches to Julia (Drew Barrymore), and when it goes back to Robbie, there's different trash, and less trash, and it isn't in the same position. Continuity mistake: At the first wedding, the left hand side (as we look at it) of the bow tie that the brother of the groom is wearing, keeps appearing and disappearing from his collar. Continuity mistake: At the cake shop for Glen and Julia's Wedding, Adam Sandler is feeding Boy George some samples of cake. First you see 2 pieces of cake on the plate. Then he feeds one to that weird person, and in the next frame with the plate it's empty. Then after that there is still one piece of cake on the plate. Other mistake: After the on-board announcement that the plane is at cruising speed and altitude, the exterior shots still show the wing flaps extended for landing. Due to structural limitations and the extra drag created, the flaps cannot be used at higher speeds. Factual error: Throughout the whole film you hear Julia saying her wedding is "Sunday August 5". This movie was set in 1985, and August 5 was a Monday in 1985. Continuity mistake: In the scene where Robbie and Julia are practicing her wedding kiss, her necklace and hair shift position on each shot. 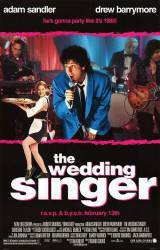 Continuity mistake: At the first wedding he is singing at, the best man comes up and talks, the microphone stand moves into different positions. In one shot it is facing forward and the next it will be backwards. It goes back and forth the whole time. Continuity mistake: When Robbie is singing at his first wedding back (Cindy and Scott's), just after George sings the backup "Holiday", Robbie then sings "It would be.." and when he sings this he lifts his left hand into shot and on his ring finger you can see something white in a ring shape around the top part of that finger, but in the next shot of him after it changes to a shot of the annoyed father and back, the white "ring" that was around his finger is no longer there. Factual error: Although the movie is set in 1985, the first exterior shot of the airplane shows an A320 (note the winglets) which didn't enter service until 1987. Continuity mistake: The back ground colour outside the banquet hall keeps changing, in the first scene there is a sign, in the next it's gone. Continuity mistake: At the Bar-mitzvah, George is not actually playing the clarinet; a synthesizer is playing sampled clarinet sounds. Continuity mistake: In the scene where Sammy is driving around the orange cones in his limo, he has to pick up a dummy of a bride and groom. In the first shot, there are no dummies there, but in the next shot there are two dummies waiting to be picked up. Continuity mistake: In the scene where Robbie is lying in the bin outside and he is talking to Julia, there is a round sort of plate or dish lying next to his right shoulder - in the next shot it is on his left side near his stomach, and in the next shot it is back again. Continuity mistake: In the scene where Robbie is back at his sisters house talking to his best friend and sister's husband, one of her children (dressed as Freddy) walks up with a picture of Robbie and Linda where he drew on Linda to make her look like the devil. When he hands the picture to Robbie, it is passed to him from the side, but in the next shot a split second later it is passed in front of him (facing frontwards) by the child. Continuity mistake: When Julia and Glen are double dating with Julia's cousin and Robbie, the cousin lifts a fry and puts it in Robbie's mouth. The camera angle changes and she is putting the fry in his mouth at a different angle.